It is no longer the actual mode of formation of glaciers, and the actual properties of the solidified masses of water are known to scholars ; it is a scientific glories of Professor Tyndall , to have been able to determine the role these wonderful solid play in the shallow reservoirs mechanism of our spheroid. This is the work of Mr. Tyndall as anyone bear the stamp of genius ; If confirmed every day by new observations, which give them a relief imposing, and produce sharper, more important. The fine studies of the English scholar, executed in part, as those of the great Agassiz, in the midst of Alpine glaciers have recently been continued on a much grander stage, the imposing theater icy fjords of Greenland. These are the theories that guided Mr. Tyndall intrepid American, Mr. Dr. 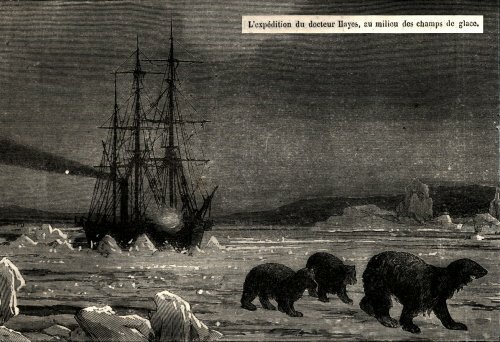 I. J. Hayes, already famous for an amazing campaign in the polar seas, amidst the majestic glaciers of Greenland. He checked there already professed doctrines today by physicists, but documents and illustrates that the young sailor recounts his summer trip to Greenland, offer an unexpected interest in revealing the tremendous power acquired by glacial phenomena on the old Green Land of old Normans. Greenland as in the Alps the surface snow on the hills, is white, dry and light ; at a lower level, it is a little harder, less flaky, slightly agglomerated. In the underlying regions, ice, completely transparent and crystalline. A solid and transparent state, the ice in Greenland is in truly magical aspects ; it forms inimitable buildings, bizarre, outrageous even, as only nature can do : sometimes cc are elegantly carved arches, and caves formed with art ; sometimes, they are massive clusters imitating the Egyptian constructions. When the sun shedding light over the palaces of nature, they are adorned suddenly pure and cool shades, clothe fantastic and brilliant iridescence, ranging from emerald green to sapphire blue. Then the columns shine like gems amid massive serrated, and the observer dazzled by these incomparable riches feels transported into the world of dreams ! Thus mountain snow arrives without completely melting, forming the sheer ice, and bring forth the natural ice of prodigious size. These solid water tanks are staggered at all latitudes, but the lower limit rises somewhat regularly above the sea level, as, out of the polar regions, we get closer to the equator. According to Dr. Hayes, the line of perpetual snow is located at 61 ° N, 800 meters above the sea level ; 69 ° is approximately 550 meters ; 78 °, 160 meters ; between 80 ° and 82 ° it touches the surface of the sea, and do not allow any trace of vegetation to occur. In Greenland, better than on the summit of the Alps, there is the real ductility of glaciers, the substance, similar to soft wax, flows gradually to the lower regions, as would a thick molasses. The glacier appears as a real frozen river, which has its current ; but while the Alpine glaciers flow at a speed of 0.10 m to 0.33 m per day, they walk more slowly in Greenland, where speed seems to vary between 0.07m and 0.20 m in the same time. The volume of the Greenland glaciers is sometimes enormous ; This is an inexhaustible mine of icebergs. Dr. Hayes has measured that had more than 100 kilometers wide, which formed in the sea a wall of cliffs 100 meters high. The crystal wall sometimes descends to the bottom of the ocean, that is to say up to 700 meters below the liquid surface. What terrible block, what prodigious pile of snow ! 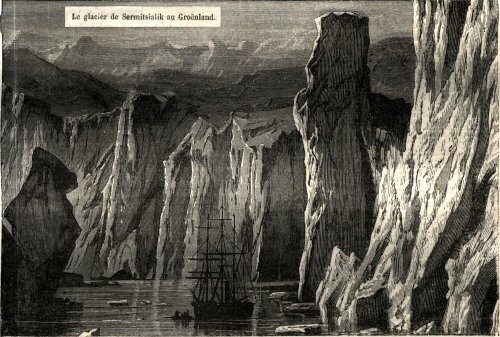 On some parts of Greenland, the American explorer observed glaciers actually slip into a bed made of rocks, and completely affect the appearance of a river. Instead of water flowing quickly is ice, which slowly rolls his crystal. Instead of hauling trees and woody debris, the river carries solid rocks. But as the river of water, the glacier in Greenland has rapids, waterfalls, waterfalls and cataracts. Near the fjord Sermitsialik, Dr. Hayes discovered a large icefall which yields nothing like grandeur and beauty as in the famous cataract of Niagara. Water is only replaced by crystal stalactites ! We will not dwell on the quaintness of the Greenland exploration ; this is not it uninteresting, quite the contrary. The history of ancient and terrible fighting that once supplied the old Green Earth after the discovery of a strange region, the gentle manners of the present inhabitants living in vicinity so little known to the European world and offer the traveler a touching hospitality, so affable, are for Dr. Hayes as many striking subjects that can exploit real writer. But we do not follow the explorer in all his stories. We just want to present its journey under a special face, and show that the new expedition provided the Earth Physics rich of valuable observations contingent, which fully confirm the modern concepts on the mechanism of glaciers on the surface of the Earth.